Anh's Story is inspired by the story of a Vietnamese refugee who left home in the early 80s. 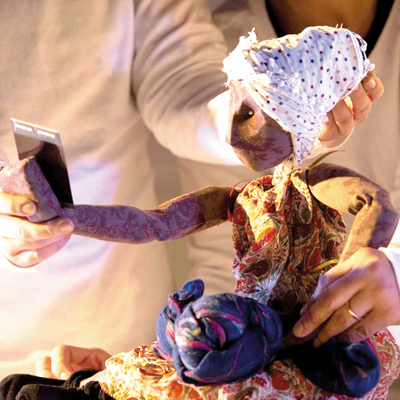 As a puppetry act simple effects, such as manipulation of objects, shadow and music, will create magical moments. The workshop will cover basic puppetry making techniques, and will also have an experienced Auslan interpreter on site. How can a plain piece of paper become a character? How can movement tell a story? Explore the imaginative world of paper and learn the basics of puppet manipulation in this workshop. Using mostly paper, participants will create their own paper character, building its identity and story. This workshop is for kids and "grown-up" kids! Keila graduated in 2010 in Performing Arts in her hometown, Curitiba - Brazil, where she worked as an actress, theatre producer and voiceover for radio dramas. More recently, she has been researching and working on physical theatre, aerial performances, stilt walking and puppetry, exploring subjects related to culture, languages, faith and identity that unite people and societies. Theatre credits includes: Chil the Kite in the Nautanki Theatre production of the "Jungle Book" for Riverside Theatre, Matilde for the New Theatre production of “The Clean House” by Sarah Ruhl, Collaborator on “iDNA” as part of the Collective 2016 for PACT Centre for Emerging Artists and Moogahlin Performing Arts, Movement ensemble for the opera of “Orfeo ed Euridice” directed by Shannon Murphy and Sam Chester as part of Spectrum Festival in March 2015. In June 2016 Keila obtained a place in the International Theatre Experience Residency in Tuscany, Italy. And since July 2015, she has been part of Annandale Creative Art Centre Collective, where she devised the original works: “Anh’s Story”, “Miscommunication”, and “She Carries”. Keila has also collaborated in performances with emerging and renowned artists presenting works at MCA ArtBar, Art & About Sydney, Melbourne Fringe Festival, Sydney Fringe Festival, Integral Aerial Arts and Canberra Beyond Festival.